Situated among the Verdugo Hills, Castaway has boasted one of the best views in Burbank for over 50 years. 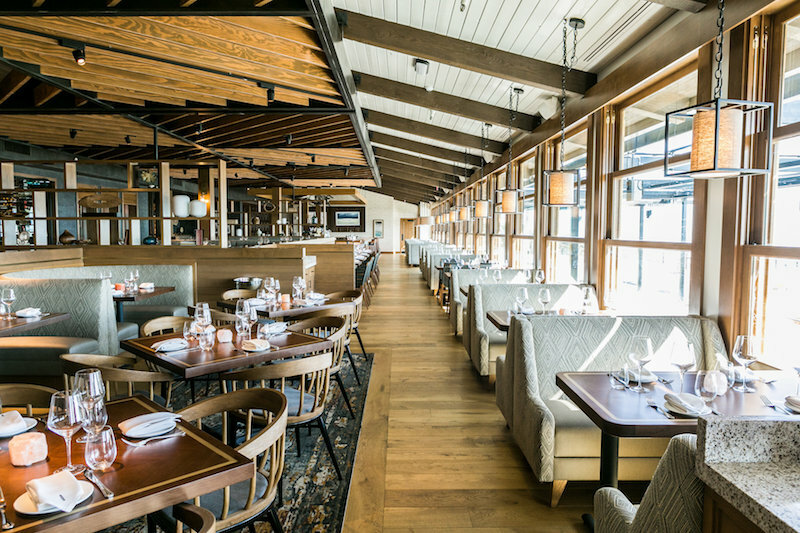 A recent renovation has taken the restaurant into a modern era, offering a sleek redesign, interactive stations, a subtle movie studio theme, and a “steak-forward” menu with an eye for affordability. Specialty Restaurants Corporation (SRC) was founded by WWII veteran David Tallichet, who opened SRC’s first restaurant in Long Beach in 1958. 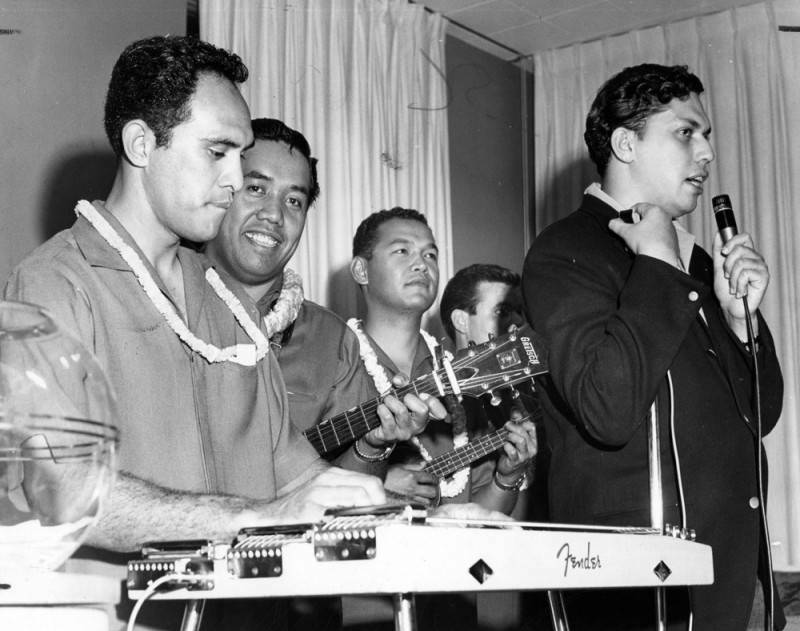 Castaway would open just a few years later in 1962, offering American fare with Polynesian influences. Tropical vibes filled the property, which consisted of a 500-seat dining room and event space that was popular for weddings and parties. A second Castaway opened in San Bernardino in 1970, and remains there to this day. Looking back at Castaway’s early days reveals a host of special events, including fundraisers, costumed balls, weddings, and business meetings. It’s also been the site of the Saturn Awards—which recognizes sci-fi, horror, and fantasy media—several times, including in 2018. Bob Hope was once among its many regulars, with the L.A. Times reporting that he could frequently be seen pulled up to the bar. You can check out scans of old menus, dating as far back as when a Scorpion cocktail cost $1.50, here. In June of 1993, the restaurant was devastated by a fire that occurred in the wee hours of a Tuesday morning. Firefighters were alerted to the disaster after a heat-sensing burglar alarm was triggered. It took rescuers 90 minutes to extinguish the flames and though there were no injuries, the restaurant was a total loss. In all, the blaze caused $1 million in damages, left over 200 unemployed, and disappointed several others who had booked weddings, prom parties, and other special events. Investigators noted the fire was suspicious from the start and ultimately ruled it an arson. Despite a $10,000 reward from SRC, the culprit was never apprehended. They began rebuilding the restaurant in 1995. Oddly enough, SRC’s LAX offering, Proud Bird, was also the victim of arson in 1984. This blaze claimed the life of one firefighter. A teenage dishwasher was arrested but later released, and both cases remain unsolved. And, despite shuttering in 2013, Proud Bird also enjoyed its own Phoenix story, re-opening in a renovated space in 2017. When the time came for Castaway to get a new look, SRC decided to move away from its tropical roots. They closed in July of 2017 and reopened 9 months and $9.5 million later. 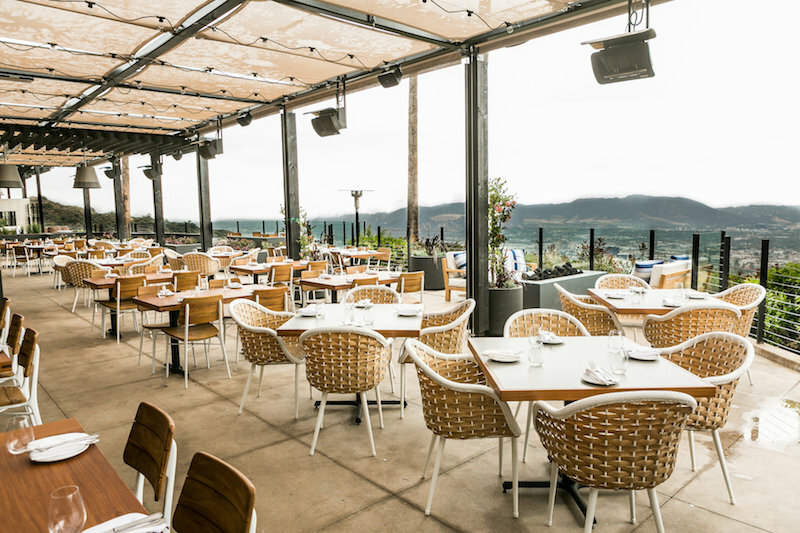 The new look is much more modern, from the sprawling dining room to the romantic patio and its sweeping views. Taking into account the restaurant’s Burbank location, various design elements are nods to the film industry. The menus all look like film scripts. A glance at the lunch menu sets the scene: “INT. 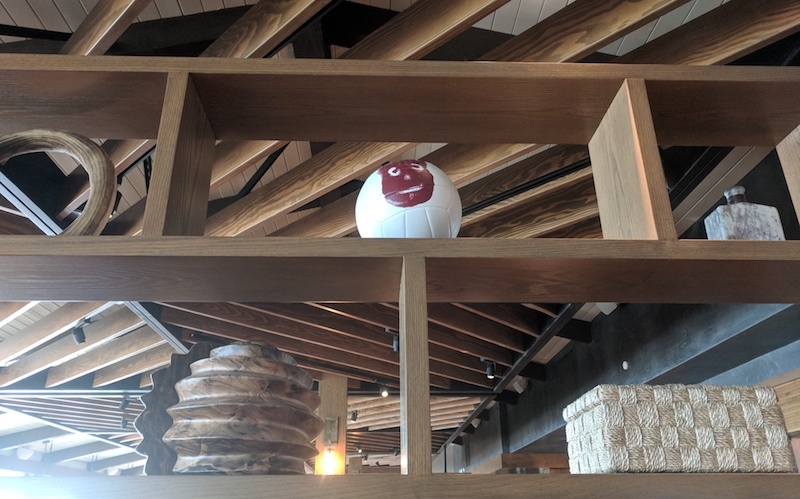 CASTAWAY PATIO — LIVELY — SOAKING UP THE SUN.” In the dining room, you can spot a Wilson volleyball marked with a bloody handprint on a shelf. Yes, that’s right: Castaway the restaurant is making a reference to the 2000 film Castaway, in which Tom Hanks is marooned on a deserted island and, in his isolation and despair, befriends an inanimate ball. Diners at Castaway, unlike Hanks’ character, will not be forced to spear their own fish, but can peruse a hearty menu of mains, sides, and charcuterie. A prime focus is on steak. To find quality steaks that can be offered at mid-level prices, Smith said they source a lot of “off cuts,” which may be wagyu quality beef, but from different parts of the cow. One example is the Zabuton, also known as the Denver Steak, which comes from the upper chuck. These smaller cuts, between 6 to 9 ounces, can be supplemented with selections from the menu’s “supporting cast” section, including lobster and truffled mashed potatoes and/or Brussels sprouts in a sweet Thai chili glaze. 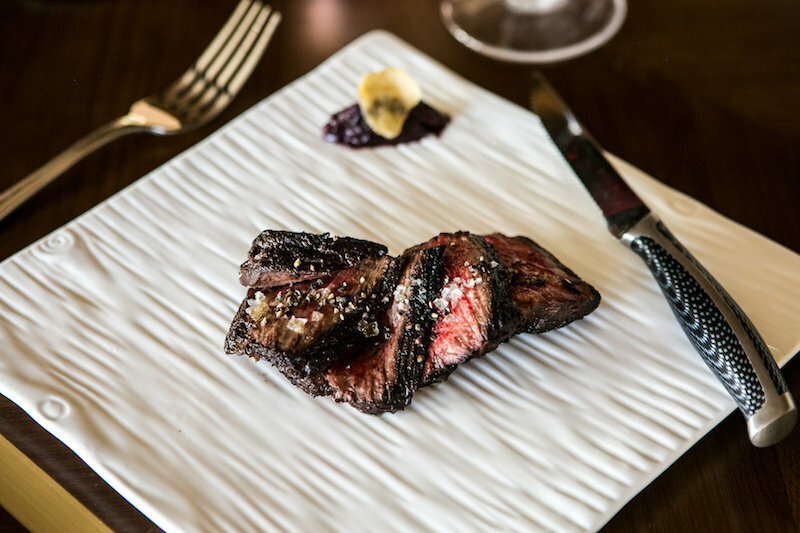 Castaway offers a 32-ounce tomahawk and or dry-aged ribeye for those who want it, and observant diners will take note of the dry aging room with Himalayan salt brick that is visible from the dining room. Elsewhere on the menu you can find seafood, salads, and shareable plates including a charcuterie and cheese selection. When possible, Smith said Castaway is moving towards making dining more of an experience. Guests may catch the butcher working during dinner service or notice the bustle of an active wine cellar where sommeliers and wait staff are constantly entering and exciting or conducting wine tastings. Castaway’s Happy Hour, which occurs Monday through Friday from 4 to 6 p.m., includes a chef preparing the charcuterie and cheese boards at the bar. Samples may be doled out as the board is prepped. Happy hour specials include $3 off tap drinks, which consist of 8 wines, 8 draft cocktails, and a variety of beers. And then there’s the Chef’s Table, where adventurous guests may enjoy a seven-course meal that begins with cocktails and a tour of the property. The 2.5-hour experience is $125/person and includes the meal and cocktail, with optional wine add-ons. On the weekends, Castaway still offers brunch, but has moved to an a la carte brunch versus their previous buffet, with options including lobster and waffles, Benedicts, and “spiked milk” cocktails reminiscent of slurping the milk left in a cereal bowl, if your cereal had booze in it. All menus will change frequently, offering new drinks and dishes on a regular basis. Castaway is locate at 1250 E Harvard Rd. in Burbank.